Then Kai posted a picture of her finished Hemlock Blanket and I thought it was so lovely that I had to make my own! So I went for a rummage in my stash and pulled out some Lambs pride worsted thats been sitting for quite a while now waiting patiently for me to make my mind up on a project. This seemed perfect! Its a very pretty shade called Persian Peacock, it has a lovely slight fuzz to it and a wonderful soft sheen too. It will go perfectly with our chocolate brown sofa! This is proving to be a nice project, so far its been pretty fast, once I got past the error on line 35, and I am entering the feather and fan chart now. It will slow down now as the rounds increase greatly in length but I still hope to aim to have this completed by the end of the weekend, lets face it, its not like the weather is lending itself to doing much else! I have three skiens of yarn so I will make mine bigger and I will be using a different cast off to as I am not keen on the one in the pattern, its a little too fussy and I have one planned that will still be pretty just not as large. I also recieved a wonderful package in the post today, I took part in a swap on ravelry, it was quite a relaxed theme, send something yarn related but also just do a little stalking and of course read your pals answers to the questionaire and send them some bits and pieces you think they would like. My pal sent me some seriously wonderful things, thank you so much Lindsay, it is all wonderful! 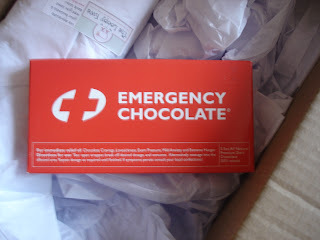 She sent some emergency chocolate, a lovely pendant with a skull and crossbones on, some bath products shaped like fortune cookies, my kids want to pinch these, they think they look very cool indeed!!! 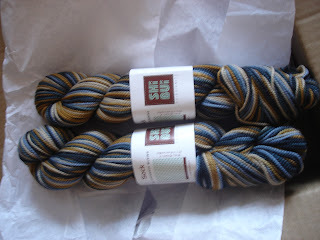 Lastly, but definately not least she sent me some Shi Bui yarn in the best colours I have ever seen! The yarn looks and feels amazing and I cant wait to knit it up into some special socks! 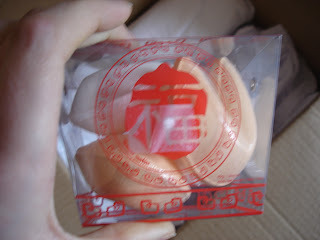 Fortune cookie bath goodies in a special take away box!! You've received some lovely squishy goodness there :D I know what you mean about the weather I got soaked when I popped into Tescos (Dalkeith) earlier. I have the coal fire on and I'm going to sit and do lots of knitting as well. ooooh you got some good stuff! what a great swap pal! That blanket looks scrummy, its a lovely pattern! Lovely things you've got there, lucky you! Your Hemlock is looking good already, it's such a nice and easy pattern that it will be finished before you know it - and the weather doesn't seem to be getting any better soon. thanks for that info, I was looking up others and others using the lambs pride seem to have used four skiens so I am wondering if i even have enough now!! 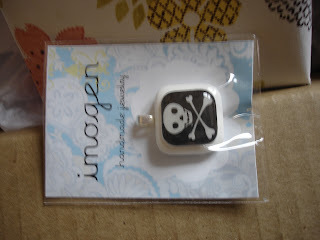 Your swap gift is truly lovely! Very good stalking indeed. What a great package! 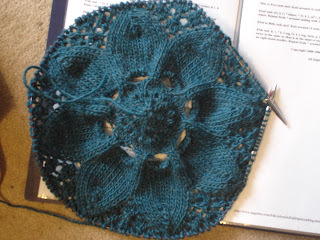 And I seriously need to knit myself a Hemlock Ring. Teeeeal! Love the Hemlock, and Lamb's Pride is such a nice yarn, too. Oh that Hemlock is looking beautiful, such a gorgeous colour.